SGM Polarimeters are used to measure the angle of rotation caused by passingpolarized light through an optically active substance.Polarimeter is fast, sturdy, with high accuracy and resolution. Because many optically active chemicals such as sucrose, are stereoisomers, a polarimeter can be used to identify which isomer is present in a sample – if it rotates polarized light to the left, it is a levo-isomer, and to the right, a dextro-isomer. It can also be used to measure optical activity of racemic mixtures. Many chemicals exhibit a specific rotation as a unique property (like refractive index in many cases) which can be used to distinguish it. 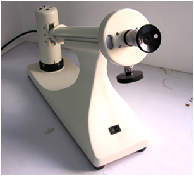 Polarimeters can identify unknown samples based on this if other variables such as concentration and length of sample cell length are controlled or at least known. This is used in the chemical industry.